Mumsy, Nanny, Sonny and Girly (1970) is a remarkably odd film. In the context of British cinema it has an interesting pedigree, however, as it is directed by horror doyen Freddie Francis and brings together a cast of character actors. Heading the list is Michael Bryant, veteran of a wide variety of TV shows and films across six decades. Ursula Howells and Pat Heywood play Mumsy and Nanny respectively, whilst the youngsters of the film are Vanessa Howard (through whom the movie- simply titled Girly- was marketed in America) and Howard Trevor (in, amazingly, his solitary screen appearance). So far, so good. But, the film disappeared for years and has barely been seen since its original release. Given the fact that far less memorable films have been widely available for years this seems a scandalous state of affairs, now pleasingly rectified by Odeon Entertainment. The nostalgia-fuelled colours and mise-en-scene of the opening credits evokes a film like The Shooting Party, but the off-screen voices (which are just too nice) create a sense of sinister foreboding, establishing a creepy aura. This is extended by the setting- a large old house in the middle of a wood- which, although it and its grounds are the only locations used in the film, proves continually interesting. ‘Interesting’ is perhaps the key word here, as despite Nanny saying ‘in a happy family you must always have rules’ early on in the film the movie itself does not stick to the conventions the family does inside their big house. Horror films- by their very nature and the workings of genre as an entity- can be formulaic and predictable. Indeed, some may argue that is exactly what we (the audience) want. Mumsy, Nanny, Sonny and Girly avoids such hang-ups, however, presenting the audience with situations as disorientating for us as they are for the latest “friend”. It is here where the film succeeds best, for in the lack of structure comes interest, and the film spirals fairly effortlessly and unpredictably through its 100 minutes. 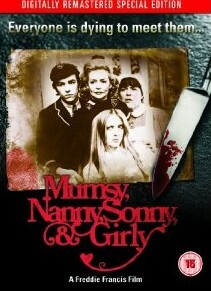 Given its contextual provenance, Mumsy, Nanny, Sonny and Girly somewhat surprisingly avoids the clichés that a more modern adaptation would go for, and instead proffers the power of suggestion (as with the saucepan near the end of the film), which avoids gratuitous gore and actually makes things more horrific for the audience as they are given minutes of suspense rather than one brief, brutal shock. Here, Freddie Francis for me evokes Hitchcock’s feelings of how to create suspense, and the film as a whole does have some nods to Alfred the Great. Where the film is very much un-Hitchcockian, however, is in its rather surreal and meandering narrative, mentioned earlier. Although this makes it different (as opposed to a film like Halloween whose blatantly clear narrative ultimately becomes a series of tedious and exploitative set pieces), Mumsy, Nanny, Sonny and Girly is not a film that can be easily assessed in terms of its cinematic merit. It is undeniably fascinating and demands to be watched, but so does a totally incompetent conductor of an orchestra- it is no indication of quality. Perhaps the major weakness of the film is its non-ending, the bewildering timing of which undermines much of what had gone before. In 21st Century Britain, where one can wander down any major high street and purchase one of the latest unimaginative celluloid productions to hit the shelves it is chastening to realise that a film like Mumsy, Nanny, Sonny and Girly could, before this year, not be bought and watched, analysed and mulled-over. Odeon Entertainment are to be praised for the care and attention they give to each release, but in this case audiences in years to come will never know the chequered history of the film’s availability such is the outstanding quality print and extras contained on this new issue of a film that is a welcome addition to any cinephile’s library. ‘Mumsy, Nanny, Sonny and Girly' is available on DVD from Odeon Entertainment.